This article assumes you have already completed the steps described in our Configuring Amazon S3 Storage Provider within WHMCS article. To start using a newly created Amazon S3 storage provider for file storage, follow the steps below. 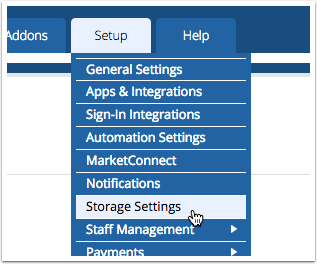 All file storage asset types and their currently configured storage locations will be displayed. To change the storage location used for a given file asset type, simply click the dropdown beside it and choose the desired new value. 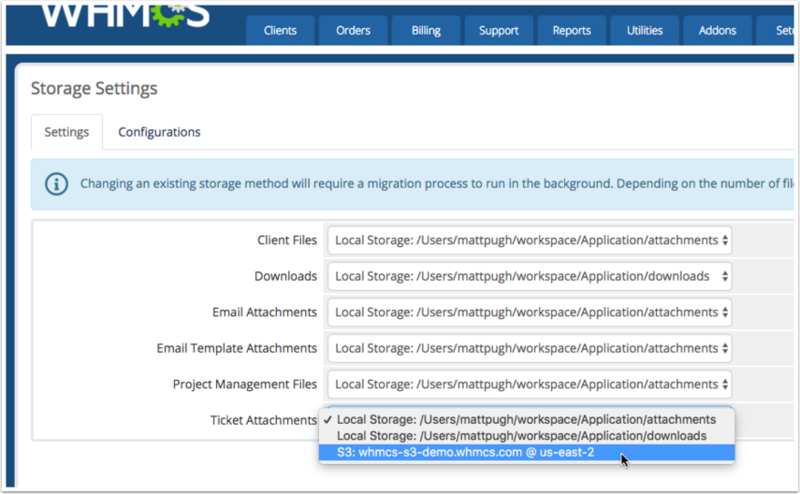 In the example below we are changing Ticket Attachments to use an S3 Storage bucket named "whmcs-s3-demo.whmcs.com"
Migrate - This will have WHMCS attempt to automatically migrate all currently stored files in the current storage location to the newly selected location. Switch - This will have WHMCS save the change without performing any automatic migration. This option should be used when you either plan to, or have already, migrated the existing stored files to the new location. If you choose to have WHMCS migrate assets, this will be performed in the background. You will not be able to change the setting again until the migration has been completed. Note that file migration is dependent upon the number of files you have present and can take some time.